Over on Smackdown! Live, the Blue show hasn’t missed a step while building towards Survivor Series. In fact, the show has used the unique structure of the upcoming PPV, which pits Blue against Red in three traditional Survivor Series matches and also sees Dolph Ziggler defending his Intercontinental Title in a cross-brand match against Sami Zayn, to not only build up some heat for the Raw vs. Smackdown rivalry, but also move its own brand-specific stories forward. Smackdown! Live has found interesting ways to introduce its teams while keeping the smaller feuds in mind. Raw can’t say the same. For weeks now they’ve been halfheartedly committed to their supposed feud with Smackdown! Live, and this week’s episode is the true nadir. While there are smaller moments that truly do stand out—the same ones that stood out last week, to be honest—the three hour show is bogged down by the endless Survivor Series announcements, which lack any sort of innovation or intrigue. Essentially, there’s a real problem with the way this week’s Raw rolls out its remaining Survivor Series announcements, and no amount of playful banter from the performers—as always, Team Kevin and Chris is delightful, and New Day find some magic again after a few weeks of feeling rather stagnant—can inject the stale proceedings with something akin to joy or spontaneity. So, the show kicks off not with a match or something to really get the crowd in Glasgow going, but rather the music of Stephanie McMahon followed by 20 minutes of exposition that establishes Seth Rollins as the fifth member of the Raw men’s team. The issue isn’t with the non-surprise of Rollins; that’s the story being told, so this step needs to be there. The issue is that Raw can find no other way to introduce these guys or make it part of their ongoing stories. The last few week’s of programming have numbed us to the presence of these main eventers (Braun excluded), so there’s little spark in seeing them all in the ring at once. Once the performers are free of Stephanie McMahon, who’s still playing a character that’s frustratingly inconsistent in her motivations, there’s some playfulness that actually works. Y2J and KO continue to delight week in and week out, and here they give a motivational speech for the ages. Jericho calls the rest of the team “stupid idiots, but our stupid idiots,” and that’s the kind of line that can elevate an entire segment. Add to that KO and Y2J reciting the same lines together, and suddenly the segment is close to being saved. Still, we have to ignore Steph/WWE’s weird insistence on pitting future partners against one another to “get it all out of their system” if we really want to compliment the segment, and that just can’t happen. Raw takes one step forward before taking three steps back. Baffling decisions kind of define the night, which will come as no surprise to anyone who’s been watching the post-brand split incarnation of Raw. The show has a tendency to gets in its own way, to overly script segments and moments that would benefit from being more freeform. The result is an inconsistency, a feeling that the smaller moments are working, but are lost in the mess. Take this week’s Cruiserweight match for instance.On paper, there’s a lot to love, like Raw using the typical tag team match to continue to build Rich Swann’s case for being the #1 Contender, which also succeeds in moving the division away form the tired story of Brian Kendrick vs. TJ Perkins. And yet, by focusing on that admittedly fruitful story Raw wastes making a moment out of Noam Dar’s debut in the town he calls his home. Sure, he gets a post-match moment with Kendrick that’s meant to elicit a cheap pop, but it’s not the same as giving him a pinfall. In other words, it’s another example of WWE being unable to get out of its own way. So, while Raw does struggle to find its spark when introducing its various teams while also dropping the ball with Noam Dar, there are moments that keep things lively. 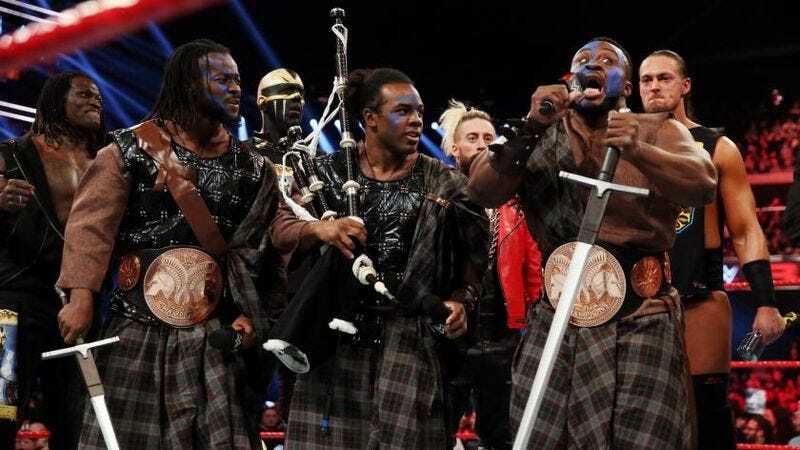 Cesaro telling Sheamus that “nobody likes you” is delightful, as is Big E’s inspired Braveheart speech meant to amp up their Survivor Series team. Within the Women’s segment, there’s Bayley getting a huge reaction from the crowd, even if it does end up derailing some of the segment, and Sasha Banks making her return after a one-week hiatus. Hell, a lot of the final hour of Raw actually manages to find some inspiration while making Survivor Series seem important, which isn’t usually the case. More often than not the final hour of Raw is a slog until the main event, but this week there’s Sami Zayn getting a deserved (and clean!) win over Rusev, and a pretty fun main event that ends with one of the more inspired and inventive finishes in recent memory. Again, these moments don’t make up for the lack of momentum present throughout so much of the show, but they do suggest that Raw has the right pieces in place. Now, if only it could figure out how to tell some compelling stories with all of them. Results: Rich Swann and Sin Cara defeated Brian Kendrick and Noam Dar; Gallows and Anderson defeated the New Day; Shining Stars defeated Golden Truth (match for a spot on the Survivor Series team); Bayley, Sasha Banks, and Alicia Fox defeated Charlotte Flair, Dana Brooke, and Nia Jax; Sami Zayn defeated Rusev (match to determine who will face Dolph Ziggler for the Intercontiental Championship at Survivor Series); Kevin Owens defeated Chris Jericho, Roman Reigns, Seth Rollins, and Braun Strowman (Fatal Fiveway). WWE is really leaning into its strengths with the video packages hyping the Goldberg vs. Brock Lesnar match. Both guys are great at pre-taped promos, and both have excellent highlight reels to draw from. Why is Stephanie McMahon berating Sami Zayn and calling him obnoxious? What is the point of that? Tonight we learned that Francesca has a Scottish cousin, and her name is Agnus. Also, she’s a set of bagpipes. The Dana Brooke fakeout into the introduction of Sasha Banks was a nice touch. Enzo telling Sheamus that he’s going to die alone was wonderfully dark and hilarious. I will unabashedly pop for every single hint of a Shield reunion moment, and tonight is no different. Damn right I wanted Seth and Roman to throw Braun through a table. If this Emmalina nonsense doesn’t end in a swerve with Evil Emma coming back, I’ll be upset.